Subaru recently launched the fourth generation of its WRX and has now, with little delay, followed that up with the top-level STI version of the car. We were invited to the Monterey peninsula to drive the car on a variety of winding roads and at the Laguna Seca race track. Here is our review of the car based on both a road test and several lapping sessions on the race track. What is the idea behind the WRX STI? Most enthusiasts will be familiar with the concept of the WRX STI, which is to build a detuned, but nonetheless pleasurably intense, street version of the type of car historically used in professional rally. In practice this means starting with an economy sedan that is significantly transformed by dropping in a roughly 300 hp turbocharged four cylinder engine hooked up to a manual gearbox and all wheel drive system. Substantial suspension tweaks are also applied, and the body is usually massaged with wider fenders and various wings and aerodynamic aids. The Subaru WRX STI and the Mitsubishi Evolution are the two best-known series of cars to follow this formula. This rally-car-for-the-street approach is attractive for several reasons. First, because World Rally Championship cars are generally built on economy platforms, the related street cars have their prices held in check, while remaining true, in a way, to their racecar origins. While prices seem always to be on the rise, the STIs and Evos of late have MSRPs in the $35,000 - $40,000 range. Those prices are hardly cheap, but they're well below those of M cars, AMG products or anything wearing the Audi S badge. The second virtue of the rally-derived formula is that the cars themselves are reasonably practical as daily drivers. We’re looking at 4-door sedans with AWD systems, so realistically a family guy can drive one of these to work in any climate (after a change of tires off of summer rubber) and can shuttle children or business associates with ease. That versatility isn’t present with the other great performance value champs, the Mustang, Camaro and Challenger. Additionally, for a certain group of people, the STI and Evo have a race pedigree that at least appears higher than most street cars. You have to squint a bit, but these cars are more literally descended from racecars than most of what you can buy and run on the street. Some of this comes from the aero appendages and the resulting look, which members of the target market will view as awesome while being viewed by those not in the buying segment as un-subtle or ridiculous. Some of the blurring of street into track orientation comes from the intensity of the factory setup, with another dollop added by the tuner community that offers a vast array of performance parts for cars like the STI. All this makes the STI (and the Evo) a top choice if you want to take your car further into the gray zone between street and track and you want it to look the part. From an engineering standpoint, Subaru has concentrated its changes for 2015 on an extensive series of technical tweaks, all designed to increase the performance or driving feel of the car. But you have to look carefully because the changes are anything but obvious. The engine, for example, remains essentially the same. The 2.5L flat four still offers 305 hp and 290 lb-ft of torque. It is mated to a six-speed manual gearbox, again as in the last generation car, along with the familiar DCCD adjustable center differential, with a 41:59 torque split. 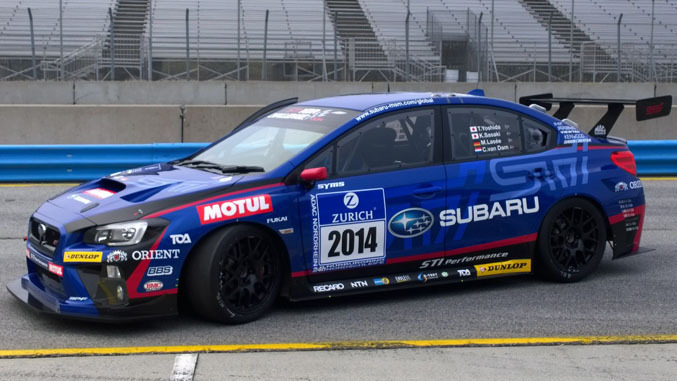 But Subaru has made several adjustments to the mechanical elements of the transmission to improve shifting precision. Subaru has also retuned the ECU so that the throttle responsive is significantly snappier, especially in part-throttle use. Active torque vectoring, in which the inside wheels can get brake energy applied to aid turn-in, is another new electronic feature. The Vehicle Dynamics Control has been improved, with the ability to reduce the intervention of the nannies by two stages. The last setting, dubbed “Off”, also turns off torque vectoring. The STI is one of the rare new cars that retains hydraulic steering (as opposed to the increasingly common electric power assisted steering that is used to reduce parasitic losses and increase fuel economy a smidge). The big difference in steering comes because Subaru engineers have quickened the steering rack, making the steering feel more responsive. The most significant changes have come in the chassis department. 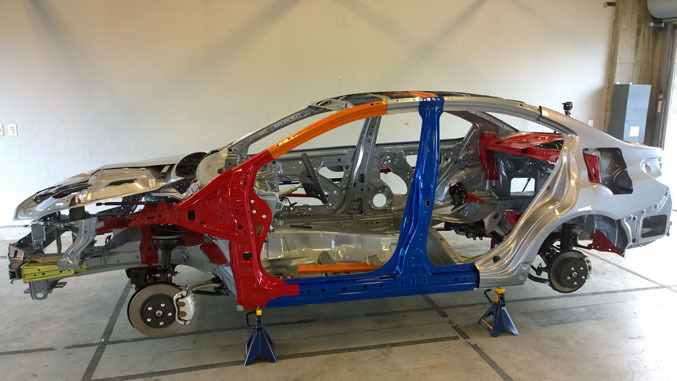 The new Impreza platform, along with substantial additional reinforcements for the STI, increases the torsional stiffness of the chassis by 40%. Spring rates are up over 20% with the result that roll stiffness rises by 24%. If you thought WRX STIs were too softly sprung in the past, you’ll want to drive this one with no preconceptions. In keeping with a recent trend against bulking up, the new STI weighs essentially what the old car did (okay, technically it is 2 lb. heavier). It also has a base price identical to the outgoing car, at $34,495. This price now includes several features that were options before, so from one perspective the price has actually gone down. 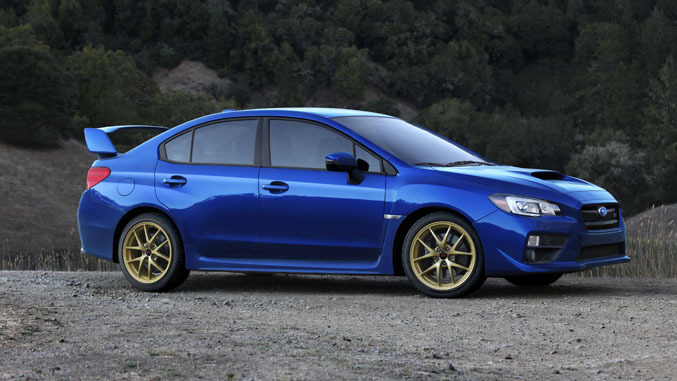 One other important change is that, at least for now, the STI is only available as a sedan (no five-door hatch). The last generation sedan represented 66% of sales, so launching with the sedan makes some sense. How does it drive on the street? The new STI is a very different beast from the old car. Cornering attitudes are quite flat, and while body roll hasn’t been eliminated, the STI is now at the lower end of the range for sports sedans without active suspensions. If you prefer a car with minimal roll, Subaru finally has a second car (beyond the BRZ) that you might like. The STI is also impressively balanced. Below the limit it feels like a very well sorted rear drive car, with impressively neutral handing. It pretty much goes where you point it. Adding to this feeling is the short lag between driver inputs and response by the car. This is the result of a solid structure, harder bushings, well-sorted mechanical designs and properly chosen ratios. Subaru has some impressive measurements of this that suggest the STI is one of the best in the business this side of a Porsche 911. Subjectively, Subaru has hit a sweet spot with the STI in that it feels responsive, but it doesn’t jump over the edge into the twitchy zone. If you’ve driven an Evo, you can appreciate what we’re talking about. The Evo is impressively wired to your brain and feels more responsive than the new STI. At the same time, the Evo can be tiring to drive. By contrast, the STI does what you ask, but minus an element of nervousness. And an element of thrill. This effort to land the STI in some kind of sweet spot applies to the engine as well. Subaru, with additional displacement to work with, delivers a rather linear torque curve. This means that the car is pretty tractable from 2000 rpm up to the red-line. But that same linearity removes some excitement from the proceedings when compared to turbo motors tuned for a big kick in the mid-range. Another way of putting this is that the STI feels fast but not scary fast. It is certainly in a category that has plenty of power to avoid being confused with low-torque cars like the BRZ or even the many recent sports sedans with 240-270 hp turbo fours. At same time, it doesn’t have the punch of cars with big V-8s. But, again, the STI seems to occupy a sweet spot on the power:weight continuum. The steering also stikes a nifty balance, being one of those systems that just seems to do what you expect. It doesn’t feel artificially geared and it is very nicely weighted. At the same time, feedback is somewhat muted, although many modern systems have this same character. As we’ve said before, involvement is an important attribute, but that doesn’t mean that every driver wants the most he or she can get. We’d peg the STI at about 82 on our involvement index. For comparison, the latest Evos run in 85-88 range depending on transmission. But another relevant comparison might be the BRZ, which comes in at about 84. What about character? Is it fun? There is a sense in which Subaru has delivered a basic platform and asks the owner to add character if and as he sees fit. For those of you who don’t do tuning, that is really just another way of saying that the STI’s character is neutral, mild or bland (depending on your desires). The STI is very linear, which sounds good, but also means that the car doesn’t do anything unexpected. That might also sound good, and if so, you’ll probably love this car. But some will want a little more communication and a little more to interact with at street speeds. 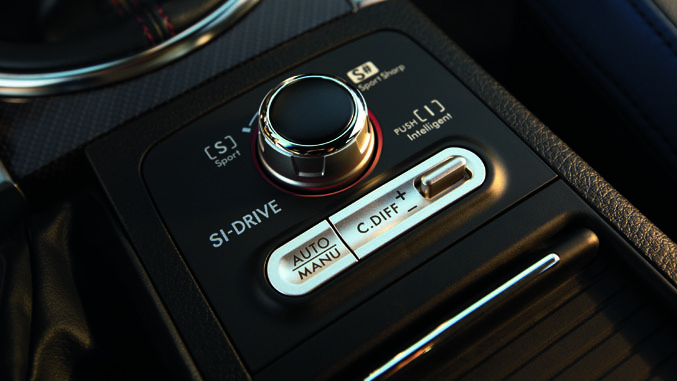 That same desire for more communication could be applied to the soundtrack that the STI serves up, which is rather quiet. Again, that might sound good, but we’d also say that it deviates rather significantly from the “race-derived” brief that seems to be part of the idea of this segment. You just don’t hear much engine sound or exhaust note from the STI. As in a BMW, you can make out something, but it comes through at pretty low volume. How is the ride quality? Given that part of the attraction of this segment is daily driver usability, ride quality might be important to prospective buyers. Based on the California secondary roads that we drove, we’d say this is one area where the STI misses the sweet spot. Now mind you, the car is so solid that the ride is probably acceptable for those who think this segment naturally involves tradeoffs and a small amount of ride harshness is okay. It will also be more appealing to those who live in warmer areas with larger Department of Transportation budgets. But if you want a more BMW-like (or, heck, Mustang –like) ride-handling balance, the STI probably goes one step too far in the direction of stiffness, and you’ll want to check out the base WRX. Does it work well for track days? We would emphatically say “yes”. We did multiple sessions at Laguna Seca, and the neutrality and stiffness that could be considered liabilities on the street confer real advantages on the track. The car is balanced at the limit and is very easy to place where you want it. The visibility is superb, which is a real advantage if you like to try new tracks or if your favorites have blind or difficult corners. The powertrain has enough pull to make braking and gear change an interesting challenge. At the same time, the car isn’t so fast that you’re likely to get in over your head if you only do track days a few times a year. To put this in perspective, we estimate that the WRX STI has a power:weight ratio of about 12.5 lb/hp (using an educated guess about wheel hp). NASA ST3 and SCCA T1 cars, which are impressively fast while still being production based (well-prepped M3s, Corvettes and Mustangs are players here), run around 9 lb/hp. And the justly popular Spec Miata class runs at about 19 lb/hp. So, you can see that the WRX STI, while not ready for road racing, splits the difference between well-known production race classes. That, we opine, should be about ideal for a lot of occasional track day folks. Turning to handling, the responsiveness and lack of delay we described above make the STI feel lighter than its specifications would suggest. That is an important element in a track day car, since after all you aren’t really racing, so an enjoyable feeling lap after lap is beneficial. The STI feels like your partner not your enemy. And pretty much all the elements work well so it also avoids landing in the frustrating (and sometimes expensive) love/hate zone. Three caveats should be mentioned. First of all, while we did 20 or 25 laps of Laguna, these were distributed across several sessions so we aren’t completely sure how well the brakes hold up, even though they seemed fine to us. Second, we ran the car on the supplied full tread summer performance street tires. We assume R compound track rubber would be even more fun, but we can’t say that from experience with this car. And finally, this is not a rear drive car, so if you push hard you can certainly induce understeer. Every car has characteristics you have to respect, but if you want to practice a pure edge-of-power-oversteer rear-drive style, this is not the best car for you. We’ve noted that a lot of cars in the current era look better in person than they do in pictures. Designers are struggling to get great shapes within the confines of safety rules and efficiency regulations. At the same time, more sophistication than ever is being applied to surface details and materials. So, while beauty is in the eye of the beholder, sometimes it helps to have a comment on whether the real car looks better than you might expect. From our time with the STI, we’d say the basic body is a little sleeker and refined than it was. But we’d have to add that this doesn’t necessarily work to the STI’s advantage. That’s because the STI design concept, at least as we understand it, is to look a bit wild and authentically racer-esque. Maybe it is over-familiarity with this class of car, but somehow the fender blisters and wing just don’t seem radical enough. At the same time, they’re too obvious to allow the STI to be “just” a sports sedan. 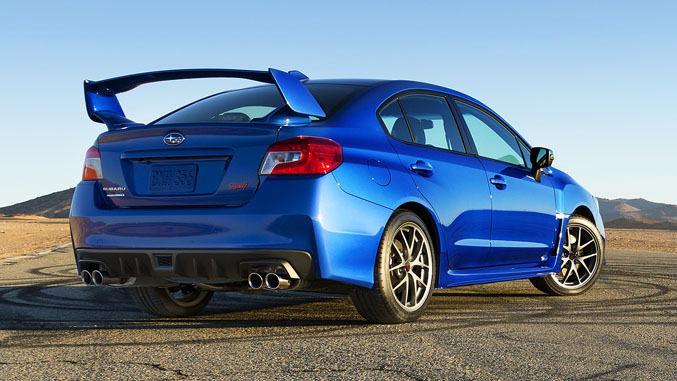 The Subaru WRX STI is a better-engineered, more refined car than it was. It is also a step closer to the kind of car that Mitsubishi has offered for years in its various Evos. We’ve heard so many people say that the Evo goes one step too far in the direction of rip-and-tear that we’d have to assume Subaru will steal some buyers from Mitsubishi. At the same time, there are more offerings in adjacent segments. New cars like the Mercedes-Benz CLA45 AMG and the BMW M235i, for example, may appeal to those with bigger budgets and more interest in refinement. The Mustang and Camaro are logical alternatives for some as well, although the brands are differentiated enough that there will probably be little cross-shopping. But if you want a flexible daily driver that not only has racecar roots but also really works for track days, the STI is now at or near the top of a very short list, at least if you have some budgetary restrictions.